ALL RIGHTS RESERVED. No part of this book may be reproduced or transmitted in any form by any means, electronic or mechanical, including photocopying and recording, or by any information storage and retrieval system, except as may be expressly permitted by the 1976 Copyright Act or by the publisher. Requests for permission should be made in writing to The Globe Pequot Press, P.O. Box 480, Guilford, CT 06437. TwoDot is a registered trademark of Morris Book Publishing, LLC. National Archives Department, Washington, D.C.
I’d like to offer a special thanks to Debra Chapman-Luckinbill for supplying the photographs of her great-great-grandmother, Nellie Pooler Chapman, and to Priscilla Newcomb for the use of the photograph of her mother, Franc Johnson Newcomb. I’d also like to thank the editors and staff at The Globe Pequot Press for their ability to take the raw material submitted to them and transform it into a quality product. I am consistently impressed with the process and the outcome. digestion; flowing thought and constipated bowel. The frontier of the wild West resisted attempts to tame it by adventurous pioneers who were hell-bent on making a life for themselves and their families on the open range. The terrain was rough and unyielding, not unlike its new inhabitants. Most of these inhabitants were as stubborn about accepting female doctors as the land was about accepting them. Women in the mid-1800s who possessed a strong desire to help the sick studied, worked, and struggled for places in medical schools. After receiving their degrees they studied, worked, and struggled to find a place to practice their vocation. 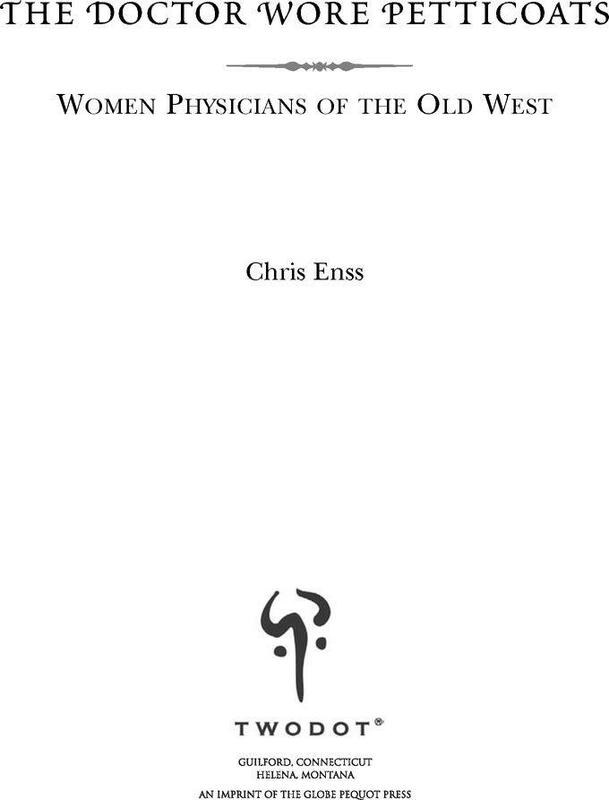 The western frontier, with its absence of physicians and high demand for healthcare, provided women the opportunity to open medical offices. It did not, however, assure them patients. For a while it seemed most trappers, miners, and emigrants would rather suffer and die than consult a woman doctor. The lady doctor repairing a head wound on an injured farmer in the nineteenth and early twentieth centuries would have had to endure criticism from skeptics and male physicians who believed women shouldn’t be in the profession at all. Resolved, That no woman of true delicacy would be willing in the presence of men to listen to the discussions of the subjects that necessarily come under the consideration of the student of medicine. Resolved, That we object to having the company of any female forced upon us, who is disposed to unsex herself, and to sacrifice her modesty by appearing with men in the medical lecture room. hope to never see a day when the female character shall be so c ompletely unsexed, as to fit it for the disgusting duties which imperatively devolve upon one who would attain proficiency, or even respectability in the healing art. 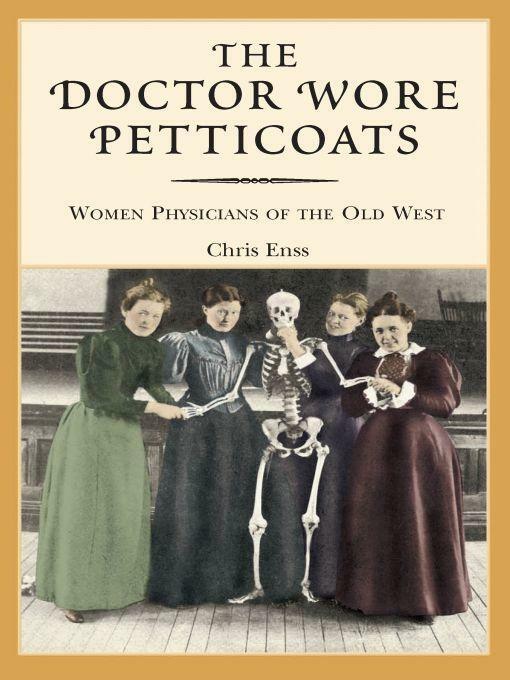 In the mid- to late nineteenth century, as the country continued expanding its boundaries beyond Independence, Missouri, in a quest to civilize the wild frontier, there were fewer than 600 women physicians in the United States. Ten percent of those female doctors decided to follow the migration and offer their services to the emigrants in the West. These women, who dared defy the sexual barriers in the medical profession to attend school and acquire a degree, were convinced settlers would eventually seek their counsel and they brazenly opened offices in frontier towns and mining camps. The result of these few courageous women braving hardship and prejudice was a change in the way society viewed women’s roles and the improvement of the health of many settlers. Doctor Eliza Cook had a strong impact on the male-dominated community in Carson Valley, Nevada. Men who felt women were “not blessed with the temperament or disposition to be doctors” changed their minds after years of watching Doctor Cook work. The tall, slender lady from Salt Lake City, Utah, set broken limbs, performed operations, and delivered generations of babies in the small northern Nevada town where she lived. She was not only a skilled physician but also a pharmacist, and she contributed numerous articles to medical journals and magazines on a variety of health related issues. She is considered by many historians to have been the first woman doctor in Nevada.